So we usually don’t do this, as avid readers might be aware. We don’t really talk a lot about restaurants and food on the blog. But I assure you, we do eat. And we enjoy it very much. And for reasons unknown to me, I more often than not document what we’re eating. 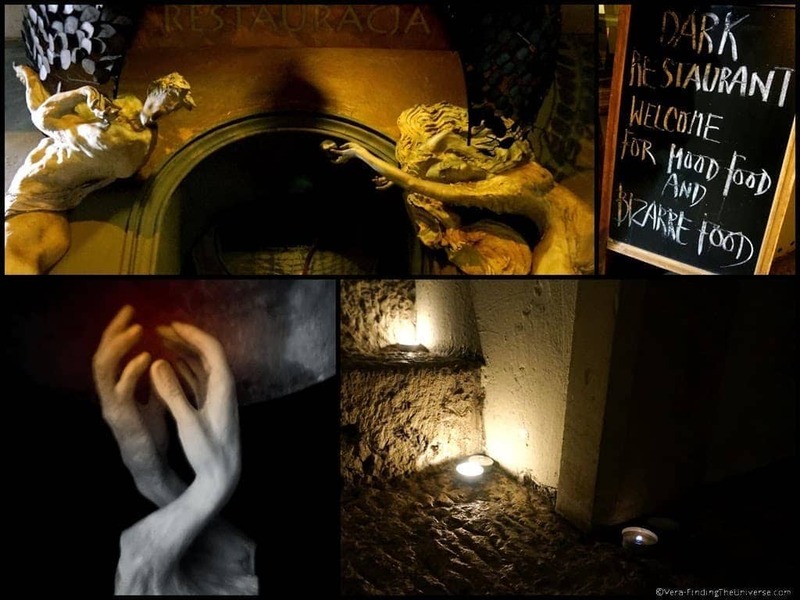 Turns out that that was lucky, because we decided we needed to dedicate write a whole post on where to eat in Poznan. Yup, the food impressed us that much. Not that it was foreseeable. When we innocently asked what a typical and traditional Polish food was, we got the following answer (twice! ): “Well, that would be… the kebab.”. Which is really less of a typical Polish meal, and more of a dose of Polish humour, but there is absolutely no need to make fun of your cuisine when it’s that good! Don’t undersell yourself, people! Unless the kebab is in fact simply breath-taking, and I missed out because I didn’t get the hint. In that case: “Oh.”. 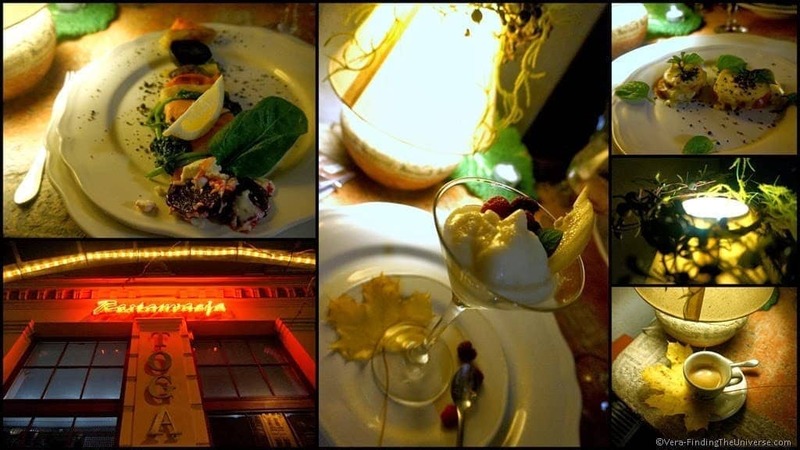 And now: our recommendations for the best places to eat in Poznan (kebabs not featured)! This is definitely my personal favourite. Because the food was nothing short of amazing. Set in a cellar, but well lit and originally decorated, this kitchen is all about slow food, seasonal food, organic food. The shopping tour to the markets in the morning determines the choice on the menu from noon on, and the owners choose good, because it’s incredibly flavourful food they serve you. 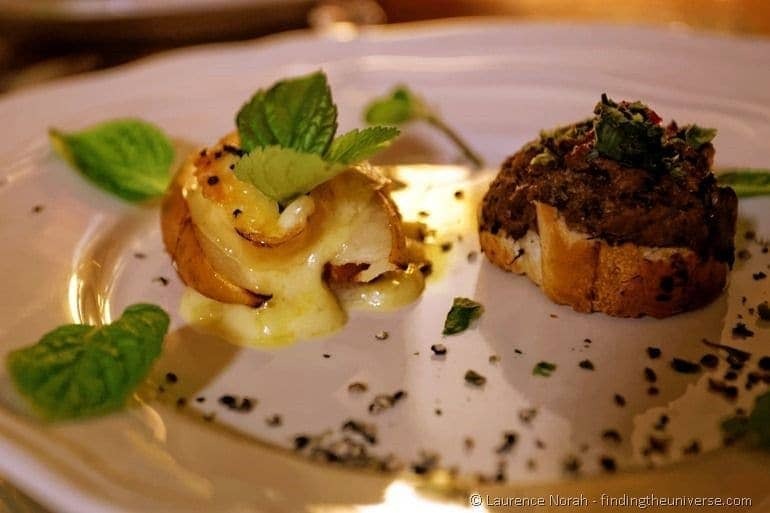 And since they are members of the Greater Poland Culinary Heritage Network, you might very well get to try a variation of a dish that was once served at the Polish Court. And who doesn’t want to eat like a king? Note: their website is only in Polish, but you’ll easily find their email-address in case you want to book a table. Situated at Plac Wolnosci. The smallest restaurant in Poland. Yes, it only has three tables, and the kitchen is in the same room. Sounds odd? Oh, but these guys pull it off! 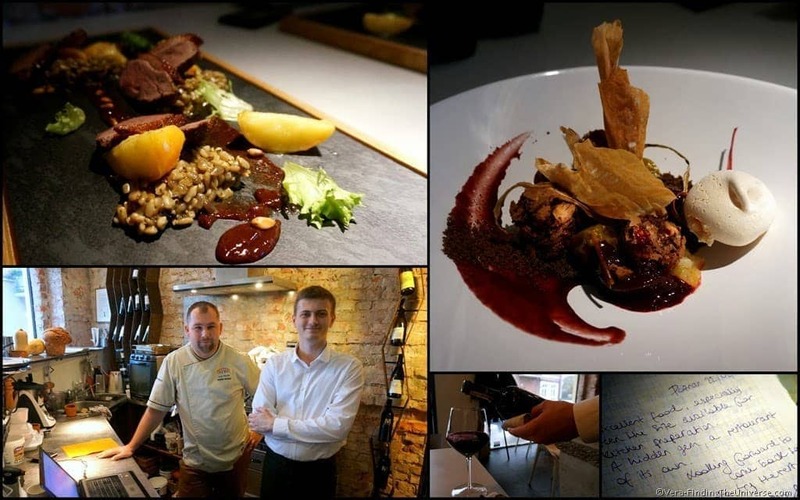 The staff consists of an award-winning chef and a waiter who deserves an award as well, and together they bring you the New Polish Cuisine, arranged on the plates to look like pieces of art. In the warmer seasons (or whenever you want to book it), the whole restaurant becomes an outdoor-affair as it is moved onto the bright red and picturesque bridge next to the Cathedral Island. Anything but average! A booking is recommended. It has the same owner as the Vine Bridge Restaurant, and the same head-chef – but is nothing like it except for even more quirky! Here you eat in complete darkness and I assure you, you will see absolutely nothing. You are taken to your table and your food is brought to you by your waitress who wears night vision goggles. There is a choice between meal types (“Mood food”, “Bizarre food” or a standard menu), and you will be asked for foods you don’t eat or are allergic to beforehand, but that’s about as much information as you’ll get. Now it’s up to your taste-buds to decipher what’s on your plate, and boy, will they fail you (with the deciphering; definitely not with the savouring)! This is a unique and tasty experience, and very well executed by the staff. We advise you to book in advance. Right on the old town square, this building contains not only a restaurant, but also a hotel, a bar, and a micro-brewery. And as far as I could tell, they aim to have every branch of their business up to top notch. 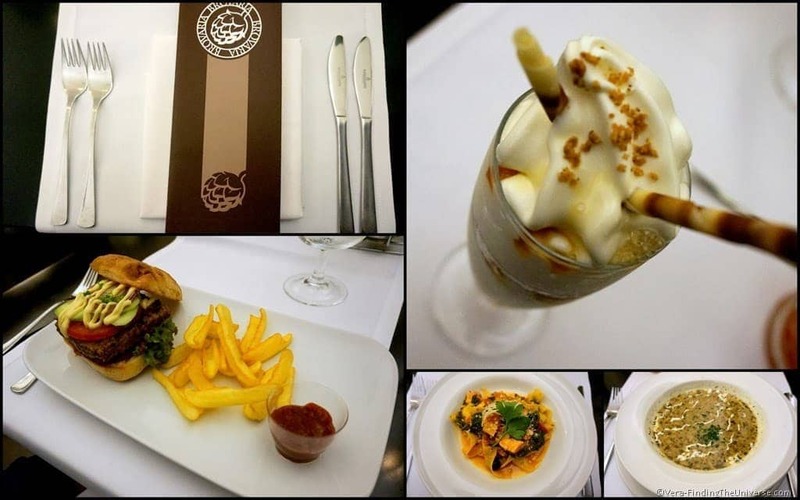 The stylish restaurant is small to medium size, and the extensive menu even contains some beer snacks, as you probably would expect from such a place. For dessert I had ice-cream with beer caramel – might just be my favourite form that beer can come in! We advise to make a booking. If you are looking for typical but also regional Polish foods, served the traditional way, this is where to go. This restaurant is central (right on the old town square), good value, and has a nice rustic atmosphere. I had my first Borscht (beetroot soup) there and it remains my favourite so far, and they offer the famous pierogi galore. Word is that the Inn’s Pierogi Master can make 500 pierogi in one hour, and I so wanted to try more variations, but these stuffed dough-pockets are much more filling than they look! 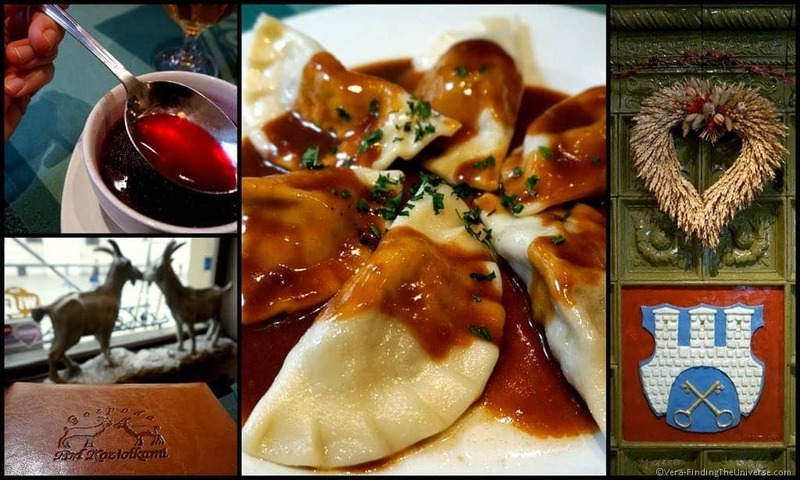 So these were five places we ate at in Poznan that we wanted to tell you about. There are many more we would have liked to try, so this is just a personal recollection, not an official list by any means! 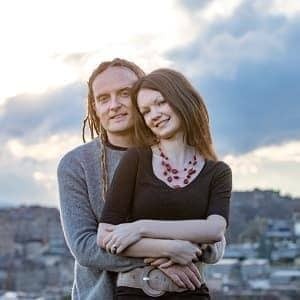 In fact, our travel blogging friend Agata who lives in Poznan, but was in New Zealand at the time of our visit, wrote us her own list of recommended places to go, and we hardly made it to any of them, so there’s definitely a lot more out there! While we found the above mentioned places really good value, compared to what you might pay in other European cities, we do have a tip for the serious budget-minded who also want their fair share of Polish food: the ‘milk bars’, canteen-like establishments, offer exactly that. We didn’t try one (next time, next time!) but to give you an idea, here’s our friends’ Dalene’s and Pete’s experience. To help you find one in Poznan: we spotted one opposite the fountain on Plac Wolnosci. Last but not least, it’s worth it to enquire if there’s anything special going on at the time of your visit. Throughout the year, there are various traditional festive days, which often come with a special dish. 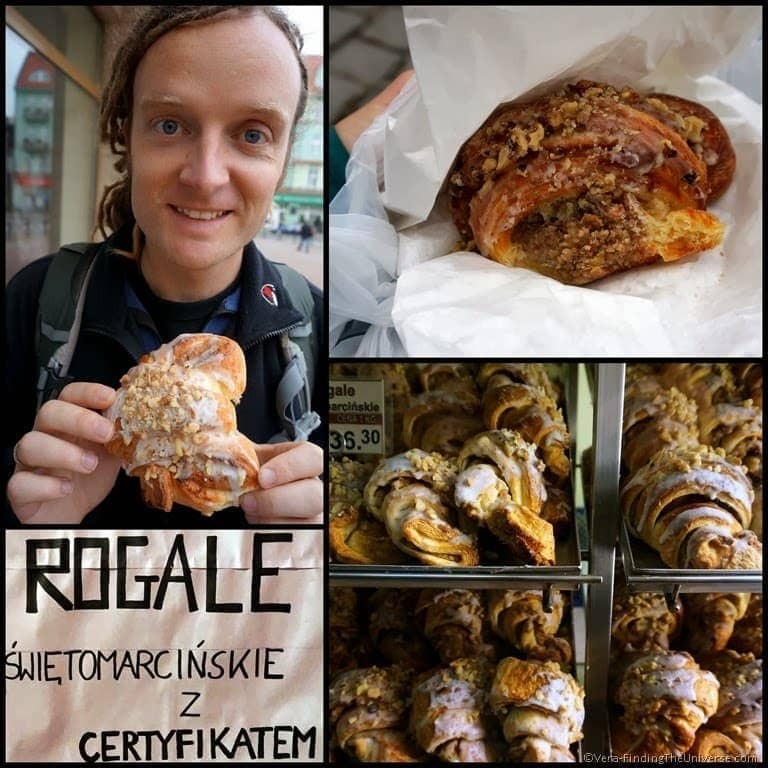 When we were in Poznan, St. Martin was coming up (which for one meant goose on the plate), and from one day to the other, every bakery and patisserie was selling the “rogale swietomarcinskie”. This pastry looks like a croissant, and when Wojciech, who showed us around, told us that he would have one of them for lunch because they were quite filling, we smiled indulgently. Sure. One croissant for lunch. Then we bought two for ourselves to try. They turned out to weigh about a freaking kilogram combined! A freaking kilogram of tastiness, that is, but yeah: one will do, folks – one will do. It’s an amazing sight, though: bakeries sell nothing but St. Martin Croissants at this time of year. People walk out the stores with bags full of croissants (a task which can be considered a serious work-out), and everyone will have a favourite place where he or she gets their croissants from. There are even official and unofficial rogales, distinguished by their title (we found both kinds delicious and failed to taste the difference). The full name, “Rogale Swietomarcinskie”, can only be advertised when the bakery has a certificate. But don’t worry if you have missed the St. Martin celebrations in November – I heard you can buy the croissants throughout the year now, if you’re really keen on trying them! Following our trips to Poznan, we’ve put together a number of posts to help you make the most out of your visit. We’ve also added in some other resources to this list that you might find useful. And that’s it, folks: so much Polish food, and not a single kebab… Eat yourself silly and thanks for reading! A big thank you to Karolina, Kamil and Wojciech, who showed us around and answered all our questions and invited us to most of these restaurants on behalf of the City of Poznan!